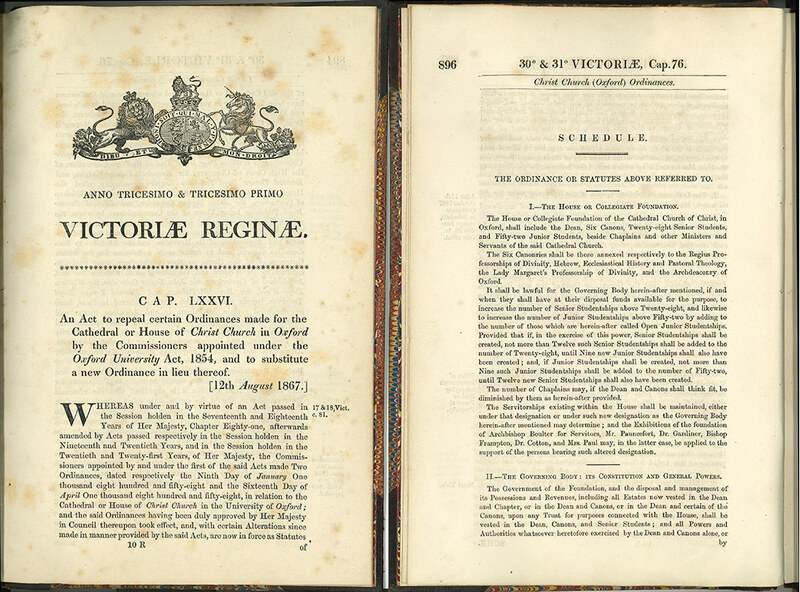 In 1867, Christ Church was radically changed by its first set of statutes which received the Royal Assent on 12 August. For over three centuries it had been governed by custom, loosely but informally following the statutes laid down by Cardinal Thomas Wolsey in 1525. In 1546, when Christ Church was founded, the governing body consisted of the Dean and eight canons. There were 100 Students – always with an upper-case ‘S’. Some were very senior academics doing research and maybe tutoring; others were graduates studying for their Masters degrees; and still more were undergraduates working their way to their BAs. All of them were paid by the endowment and could stay here for life as long as they met certain criteria: they had to pass their exams at the appropriate times; they had to remain single and to be ordained; and they were not permitted to earn a wage which would be sufficient for their support outside Christ Church. Of course, not everyone wanted to stay forever. Many were destined to run the family estate, or go into Parliament, or law, or the army. Most would become parish clergy. Helping to fund all these Students (and all the college servants paid by the endowment, too) were the commoners, conventional fee-paying undergraduates. These men were divided by class, each class paying different fees: Noblemen, Gentleman Commoners, Commoners (the majority), and servitors who did basic jobs around college to earn their tuition. The Students had always been a bit of a thorn in the Dean and Chapter’s side. They were always complaining that they did not receive any cut of the dividends that came from the college estate (these were divided between the dean and canons). Often, in times of famine or other shortages, it was the Students’ meals that were reduced. And, of course, they could see that in every other college, the Fellows had considerable input into the management of their establishments and, by the beginning of the nineteenth century, were being appointed on merit, rather than by old-fashioned patronage. By the middle of the nineteenth century, the Students were beginning to rattle their cage more seriously. Dean Gaisford, who was anything but a revolutionary, was digging in his heels against the reforms that were taking place across the whole University. But Gaisford died in 1855 and, in his place, came the energetic Henry Liddell. Although Liddell was not entirely convinced of all the new ideas, he understood that change was necessary. For nine long years, between 1858 and 1867, the Chapter, the Students, and University Commissioners argued about how things should change. 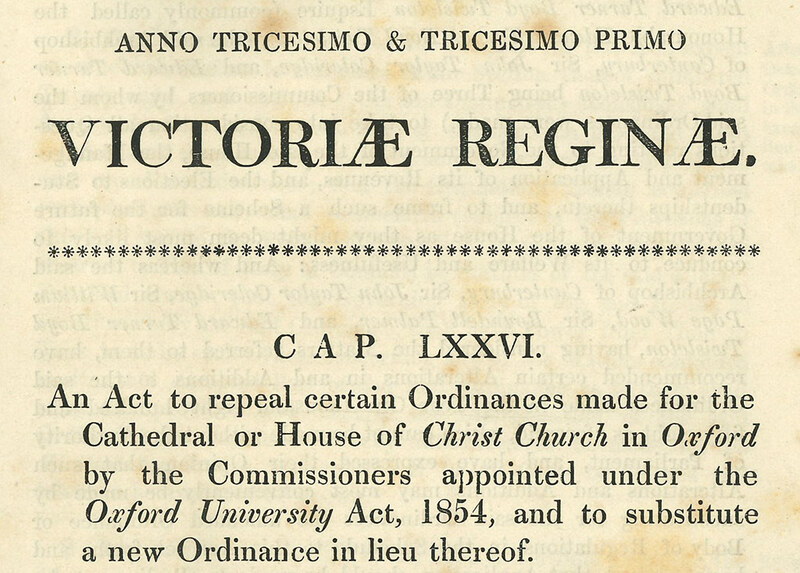 Eventually, agreement was reached and the Christ Church we know today came into being; with the Dean head of both cathedral and college; the canons, now six rather than eight, some of whom were attached to Regius Professorships, running the cathedral but also with some input into academic life; and the Students who would, once the old system had run out, form the Governing Body, essentially Fellows. No longer would there be undergraduate or post-graduate Students, and no longer would there be distinction of status between the Junior Members. 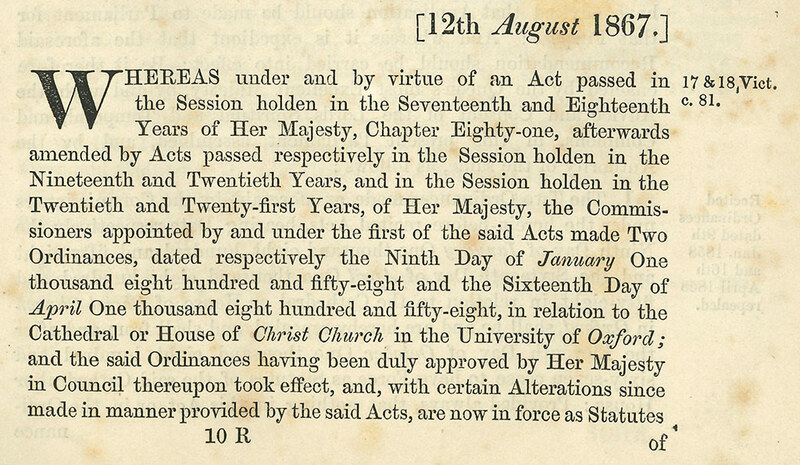 The Christ Church Oxford Act of 1867 was a masterpiece of clever compromise. 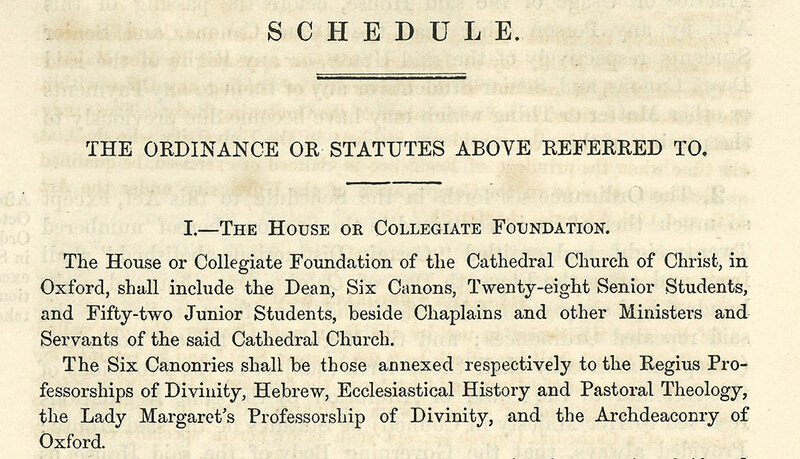 Essentially, Christ Church had brought itself into the modern University without losing its unique dual character of college and cathedral.